NEW and IMPROVED water resistancy 50m MWC watch with date window, upgraded from the issued watch, with a screw back for the improved water resistancy, comes with manufacturers guarantee. 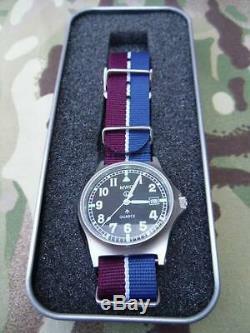 This is a stainless steel G1098 watch AND strap for the RoyalAir Force, proudly worn by the members of the Service. The watch strap is is of excellent construction and quality materials used throughout. The strap features the colours of the Royal Air Force stable belt. The straps fit the Service issue G1098 wrist watch, or indeed any other type of watch with similar fittings (18mm strap). They are 26.5cm in length (longer than the average available) and made of a stiff nylon material that will not fray at the ends. The width of the strap is 18mm. To the end is the retaining clip and pin, there are also three other metal rings to retain the watch on the strap and to hold the loose end of the strap when fitted for use with smaller wrists. There are more holes than normal on these for smaller wrists. A great quality wrist strap to allow the wearer to show true allegiance to their capbadge. Dispatched 2nd class recorded signed for...... The G10LM is our latest G10 model and is a slightly smaller more compact version of the MWC G10 100m. The G10LM replaces several variants of the MWC G10A and although it is identical in size and appearance to the G10A it has a date window, solid stainless steel case, 50m (165ft) water resistance, screw caseback and screw strap pins. The advantage of screw strap pins it that they have the strength of military fixed pins but provide complete flexibility to use straps which are designed for watches with civilian spring pins so where other G10 manufacturers use fixed bars forcing owners to use NATO straps this watch enables you to use any type of strap you choose. Although this watch is similar in appearance to some competitors models it is vastly different in the actual specification details. For example where competitors watches usually have a push on caseback this has a screw caseback, competitors frequently use perspex crystal whereas we use actual glass which is much more scratch resistant. Width is 35mm excluding crown and 39mm including crown. Crystal diameter is 31.5mm. Strap: 18mm Military Webbing Strap in RAF Stable belt colours. Lug Type: Screw in Military Spec lugs. Lug to lug: 42.5mm. The back of the case bears various contract markings. The Watch is delivered in its original packaging tin and has a full factory guarantee. The item "Improved 50m waterproof MWC G10 watch with date + RAF strap Royal Air Force" is in sale since Saturday, October 22, 2016. This item is in the category "Collectables\Militaria\Other Militaria\Army". The seller is "g10formenuk" and is located in NORTHAMPTON.